Volunteer pupils met Police Community Support Officers (PCSOs) to have their road safety questions answered - learning about the speed limit and the risks caused by speeding cars; what happens to people who are caught speeding and the dangers of crossing the road between parked cars. Pupils were also taught about the impact on air quality caused by traffic congestion close to school buildings and playgrounds. The children worked with the PCSOs and officers from Manchester City Council’s highways and neighbourhood teams to check the speeds of cars passing on the road and were shown the council’s CCTV car, learning how to operate its cameras with the help of staff from contractors NSL. 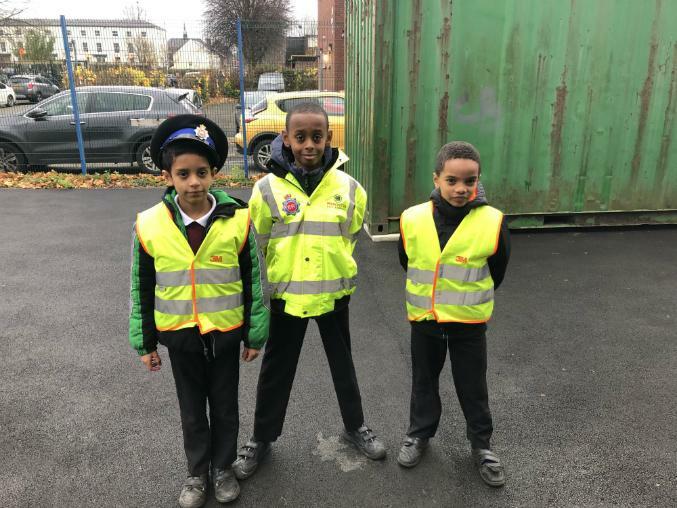 Participating schools will be running Junior PCSO schemes, with regular ongoing activities throughout the year and a citywide competition is being held to design the special hi-vis jackets which Junior PCSO’s will wear while on ‘duty’. Jackie Murray, Family Support Worker at Webster Primary School, said: "The pupils are really excited to be taking part in the Junior PCSO activities, which are a great addition to our efforts to promote road safety to both the children and their parents. "They learned a lot on the day and have also been creating posters and poems, providing messages to take home to parents about how we all have responsibilities when it comes to road safety. "We're also keen to improve our local air quality by proactively encouraging more parents and children to walk to school." The sessions were part of a range of activities held at schools across the city, with a focus on engaging with road safety issues with both pupils and their parents, with support from partners including Greater Manchester Police and Greater Manchester Fire and Rescue Service, Bikeright! and Living Streets. Thanks to Bikeright!, children from participating schools are receiving ‘Bike Smart’ training. Through the training, children are taught the basic skills involved in cycling and earn certificates and badges by passing the course. The benefits include helping children to become fitter and healthier, while also boosting their self-esteem, independence and understanding of the rules of the road. The council and schools are also working with the UK walking charity Living Streets, who are encouraging pupils and parents to sign up to walk or scoot to school. Living Streets are explaining the health benefits of walking for individuals and the wider community, through reduced congestion and improved air quality. Activities are designed to be on-going, continuing year-round, to ensure that road safety is kept on the agenda through regular road safety assemblies, pledges to ‘Walk Once a Week’ and other enforcement and engagement efforts. Manchester City Council's Executive Member for the Environment, Planning and Transport, Councillor Angeliki Stogia said: “This week of activities, made possible thanks to the great work of a range of organisations, has been extremely valuable in encouraging grassroots action and involvement in road safety, raising awareness of this issue and getting vital messages across to children and their parents. Manchester schools, parents and communities can access further information and advice on Road Safety at www.manchester.gov.uk/roadsafety.